The Alaska Republican Party on Saturday sent a strong message to defectors. 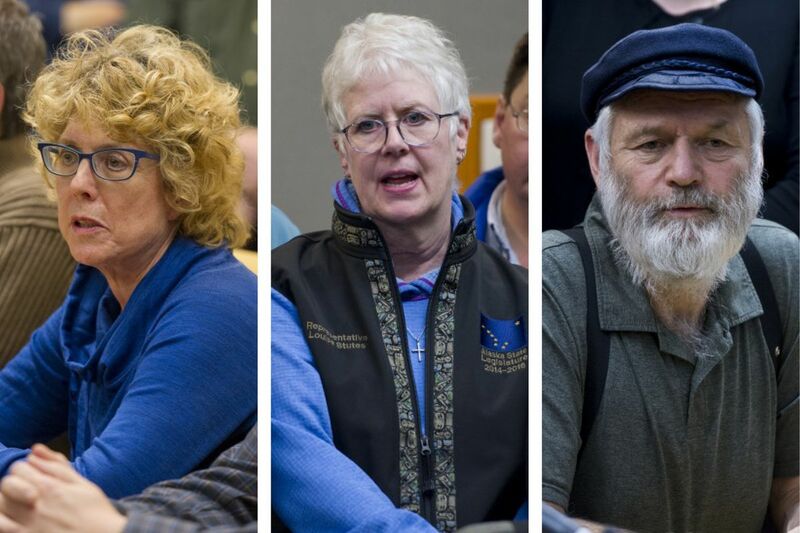 Voting members of the party's State Central Committee overwhelmingly chose to no longer support three of its own who last month joined a majority Democrat coalition that will lead the Alaska House. Those three are Reps. Gabrielle LeDoux of Anchorage, Paul Seaton of Homer and Louise Stutes of Kodiak. With the party voting 56-4 to withdraw support for them, the Alaska Republican Party and all associated clubs and districts can't donate money to their re-election campaigns. It also means the party is allowed to recruit candidates to challenge those three representatives in the future. Tensions in the Alaska Republican Party have been rising for more than a year. They came to a head when LeDoux, Stutes and Seaton decided to join the coalition, which, alongside them, comprises 17 Democrats and two independents. At Saturday's meeting, all three effectively gave the same reason for their nonpartisan move: prioritizing their constituents and the state ahead of party loyalty as Alaska tries to solve a multibillion-dollar budget deficit. "I'm really sad to be here," said Stutes. "I am a strong believer in the basics of the Republican Party. But I am a strong believer in my constituency. My constituency wanted something done with this budget." Seaton said that he had made it clear since campaigning earlier this year that he didn't think the Legislature could continue to organize "simply on partisan grounds" and that lawmakers needed to focus instead on the fiscal crisis. "I make no apologies," LeDoux told the room. "I think we're doing what is best for the state. We're going to do what we're going to do, and obviously you're going to do what you're going to do." Originally, the plan for the meeting was to vote on a written resolution stating that the three representatives were "guilty of violating" Alaska Republican Party rules. That resolution was ultimately tossed out in favor of a more informal vote to remove support. "The three of them turned their backs," said Alaska Republican Party vice chairman Rick Whitbeck. "They can talk about how they are constituency first, but you still run under the auspices and platform and belief of the party that you run under." If that resolution had been approved, the action would have amounted to a formal censure, Whitbeck said. Bruce Schulte, an Alaska Republican Party district chairman in Anchorage, was one of the few people who opposed pulling support. "If there's going to be a sanction, it should come in the form of a (Republican) challenger or loss of a vote," he said, adding that he found their arguments about putting principle before platform and answering first to constituents compelling. "I'm not saying they're without blame," Schulte said. "But they're not primarily answerable to this group." Alaska's new House coalition marks a huge shift in state politics. For more than 20 years, Republican organizations controlled the House.